Again and again, antibiotic gains the centre stage of discussion. 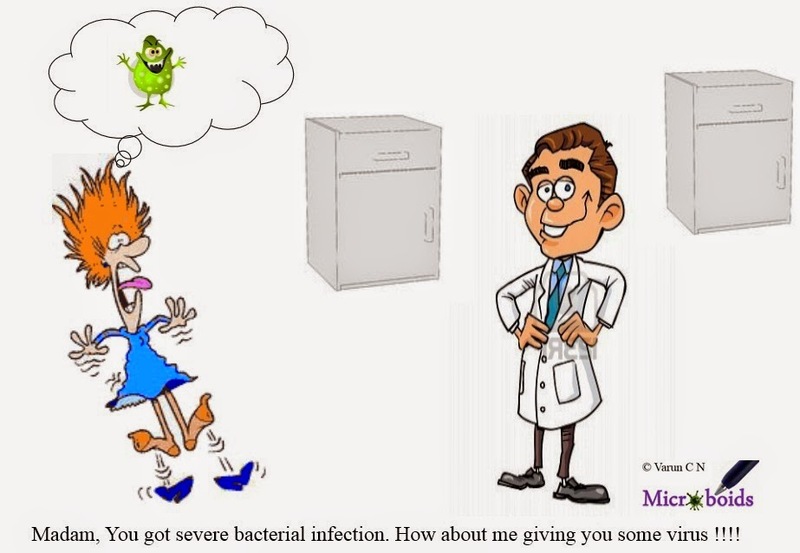 In this blog, I have several times written about antibiotics. Most often readers are left with an impression that antibiotics has been something that has come into picture only decades ago, if not centuries ago. You are right, if you think of the tablets and pure chemical forms that is being used in modern medicine. However, there are studies that have shown, for example traces of tetracycline in human skeletal remains from ancient Sudanese Nubia dating back to 350–550 CE. It is likely, that it was not used in its pure form but was somehow through the folk medicine preparations. Oh yes, microbes have been producing antibiotic compounds for millions of years for their own interest. But the concept of directed use of antibiotics started with penicillin. Of note, Pyocyanase prepared by Emmerich and Low from Pseudomonas aeruginosa is the actual first hospital drug to be used. For all discussion purposes in literature, we refer to as Pre-Antibiotic and Antibiotic era to denote time before penicillin and after penicillin. Antibiotics was such a big hit in science when it was initially introduced, a statement was made "Battle on infectious disease is won". But over the past 60 years we have been proved wrong. Bacteria is battling hard. So much so is the problem, WHO recently released a warning that we are probably stepping into post antibiotic era. I wouldn't say that we have already entered, but we are definitely on the edge. A recent internet page posted a comment noting that we already have entered the era. This is a little bit of hype. But we are on the process for sure. The natural question that you could come up with is what is the alternative to antibiotics. That seems to be a very difficult question to answer. For the current generation of practitioners, it would be nearly impossible to think of medical intervention without antibiotics. I could see some possibilities though. For example, a technique called "nanosponge" is in research for use against MRSA. The technique basically uses real red blood cell membranes around biocompatible polymeric nanoparticles, which act as decoy once in the bloodstream, absorbing the damaging proteins and neutralizing their toxicity. No they are not antibiotics but can be considered as anti virulence compound. Theoretically this could be applied to many more pathogens. The second example that I can think of is in context with treating sepsis or bacteremia. Blood stream infections are often difficult to treat infections. An approach is to filter the microbe out. Maybe I could call it "pathogen dialysis". The concept proposal is to add nanoparticles with bis-Zn-DPA to a patient’s blood when it is already outside the body (something like dialysis). The bis-Zn-DPA (Bis(zinc(II)-dipicolylamine) coordination complex) selectively binds the bacteria. The synthetic molecule attaches strongly to molecules that are ubiquitous in bacterial cell walls but are not present in membranes of human cells. That means only bacterial cells are bound. The attached nanoparticle is a nanomagnet which can be easily pulled out with a magnet-based system. This is not just a concept proposal. A proof of concept study, using a bovine model system the researchers have been able to pull out E coli with as little as 2 cycles. The third example that is most popular in current literature is the use of phage therapy. Bacteriophages or simply phages are naturally occurring enemies of bacteria. By using right combinations of phages (referred as phage cocktails), it is possible to selectively attack pathogen in question. By definition, phage doesn't infect mamallian cells and hence should be safe. The concept of using phages is not a new phenomenon. FDA has already approved a bacteriophage spray to be used on vegetables that are eaten raw. The lytic cocktail can kill hard strains such as E. coli O157:H7. A clinical trial against drug resistant P. aeruginosa, in chronic otitis patients have shown good clinical correlates. With more and more MDR appearing on the scene, we should expect more trials. To conclude, I don't expect that antibiotics will be totally useless. As mentioned in my previous posts, we are discovering new antibiotics. Fast track testing and approval have enabled some incentive for fresh chemicals to be pumped in. But the basic stress on requirement of antibiotics is still very high. The post antibiotic era would see totally novel ideas to combat bacteria. That would reduce the burden of antibiotic usage. But, a complete absence of antibiotics... "I doubt". At least not till we have developed and validated new ideas, which will take a few more decades. HIV is one of the most well studied virus in terms of global health. As I have repeated multiple times in this blog, it still haunts the best brains and no absolute cure or preventive measure is available. Except for a handful of cases, where people have demonstrated complete cure, or seem to be never infected. But just to say that as humans never evolved defence strategies against retrovirus is not true. Indeed our cells have restriction factors for multiple steps but virus has its own counter strategy. Indeed HIV has evolutionary advantage in terms of its speed of evolving which we don't have. The restriction factors so far described include- Cyclophilin A, APOBEC3, TRIM-5α, SAMHD1, Mx-2 and BST-2 (read my previous post here). Of all these TRIM-5α has a special interest. That is because, HIV doesn't produce any factor to counteract its effects yet seems to be not effected by it. In other words Human TRIM-5α seems to be ineffective against HIV. And second, the monkey version of it is too good in defending from HIV. What is the difference? TRIM 5α (Tripartite motif 5α) or RING finger protein 88, was first identified in monkeys. It was demonstrated that expression of RhMTRIM5 ( Rhesus monkey TRIM 5 ) in human cells, which are normally permissive to HIV-1, restricts HIV-1. In human cells the action of TRIM 5α is very bleak. It is known that the TRIM interacts with capsid of the HIV in cytoplasm. TRIM5 spontaneously forms a hexameric protein lattice, which is greatly enhanced in the presence of the capsid lattice structure. RING stands for "Really Interesting New Gene". Many different proteins are known to have structure referred as RING domains which belongs to a super family of zinc finger proteins. They basically contain a Cys3HisCys4 amino acid motif which binds two zinc cations. Their major function is in ubiquitination pathways. The probable role is to bind capsids and subsequently process the capsid to ubiquitination. There is some proof that the capsid is an essential element in importing the PIC (Pre integration complex). That explains how TRIM5 is supposed to be useful. But just as I mentioned, TRIM5α seems to be not efficient enough. The question as to what is the reason for inefficiency is explained in the latest paper in nature. Based on a series of experiments the researchers concluded that the huTRIM5α (Human TRIM5α), was much less stable than the orthologue monkey version. By introducing mutations in B30.2/SPRY domain (as little as 5 mutation), the stability was increased with better restriction activity. But that begs a question. Evolutionarily why did we change the sequence into a less stable factor? I don't have a clear explanation for this question. I have been told that TRIM restricts MLV (Murine Leukemia Virus), with a similar kind of capsid attack approach. It is my belief that probably TRIM5 is an important restriction factor for other retrovirus and HIV being a more recent phenomenon there is a lag. This study has set a small opening to look into pharmacological designs to improve the stability of TRIM5α. But that also requires us to understand the mechanism of action and the chemistry of interaction. Oh yes, you would say that we have a new perspective to look at.